Can the G510 become an affordable mid-range miracle? Big screen at a low price. The G510 shows that Huawei really does have the ability to compete against the well established smartphone manufacturers. It's fine for everyday use, but it struggles with more demanding tasks and the battery life isn't brilliant for movies or games. The Huawei Ascend G510 sits somewhere in the middle of the Chinese company's Android range, squaring off against the likes of the Sony Xperia U, LG Optimus L5 II and the Windows-toting Nokia Lumia 620. Huawei, the name everyone knows but no one can pronounce, has established itself as a company no longer tied to the white label, network-branded handsets. Previous offerings in the form of the Huawei Ascend G300, Ascend G330 and Ascend P1 are starting to give way to the Ascend P2 and Huawei's phablet, the Ascend Mate. The Huawei Ascend G510 has a full price of £130 (around AU$200 / US$200), meaning it is likely to land in the hands of teenagers, students and first time smartphone buyers alike. The phone itself is a very smart affair, the all-glass front and black bezel taking design cues from, well, just about every smartphone ever designed. This is by no means a bad thing, with the Huawei Ascend G510 looking like a premium phone, rather than aiming at the lower end of the spectrum. Under the hood, Huawei has chosen to power the Ascend G510 with a dual-core 1.2GHz processor, sat alongside a 5MP rear-facing camera sensor, and a 0.3MP front-facing sensor, and also comes fitted with NFC and DLNA streaming capabilities, and DTS sound. To make use of this hardware, Huawei has retrofitted the Android 4.1.1 Jelly Bean software with its own custom UI, called Emotion. With the Huawei Ascend G510 measuring in at 134 x 67 x 9.9mm (5.3 x 2.6 x 0.4 inches), it sits nicely in the hand, and the 4.5 inch screen is the right size for one handed use. 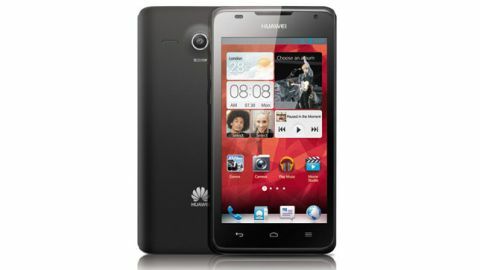 At 154g (5.4oz), the Huawei Ascend G510 is by no means the lightest of handsets, with it sitting noticeably in the pocket. The glass face of the Huawei Ascend G510 holds no physical buttons, but there are three soft keys hidden in the bottom of the bezel. The only physical buttons are the volume rocker and power/lock, situated on the top left-hand side of the Huawei Ascend G510, with the uncovered micro USB port in the bottom-left. We initially found the positioning of the power/lock button awkward, given its usual position on the right-hand side, or top of smartphones. This faded after prolonged use though - it's just a case of getting used to it. The three soft keys that we mentioned earlier are situated within the lower portion of the black bezel. From left to right are the Back, Home and Menu buttons, with there being no LED light behind them making it a little awkward to find the right button, especially while in the dark. The top of the Huawei Ascend G510 houses the 3.5mm headphone port. Huawei has generously made the back cover removable, enabling you to carry extra batteries around, as well as giving you access to the microSD and SIM slots. The back of the phone holds the 5MP rear sensor, as well as the LED flash, speaker, microphone and obligatory branding. The box holds no surprises, with the Huawei Ascend G510 bringing the separate USB plug and charger/data cable that we have become accustomed to, as well as a set of cheap headphones that doubles up as a hands-free headset. In all, the Huawei Ascend G510 makes a decent first impression, with the all-glass front alluding to a premium device. After extended use the phone can feel a little heavy, but it's a sturdy device, one that we imagine won't fall to pieces if you drop it (not that we're saying you will).